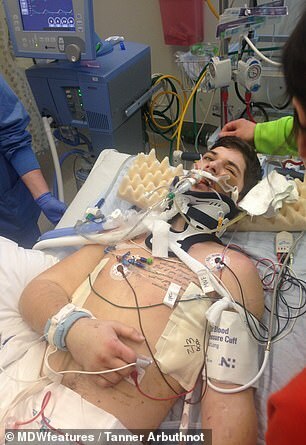 A motorcycle accident left a racing fanatic paraplegic and in an induced coma for a week. 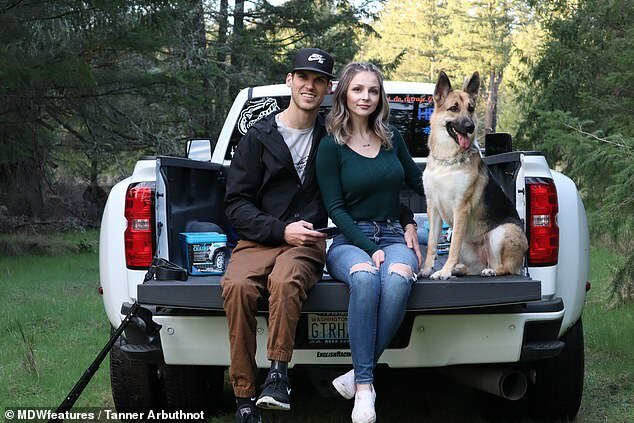 Tanner Arbuthnot, 25, from Washington state, was riding his motorbike in January 2016 when a truck pulled out and hit him head on. 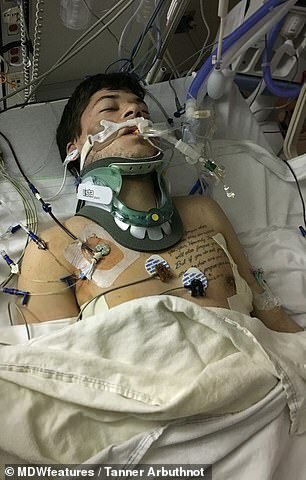 Pinned between his motorcycle and the truck, he suffered a brain bleed, shattered vertebrae, spinal cord injury, collapsed lungs, and broken wrists, legs and ankles. Doctors told Mr Arbuthnot’s family to say goodbye – but he pulled through and endured 13 life-saving surgeries in just one month. 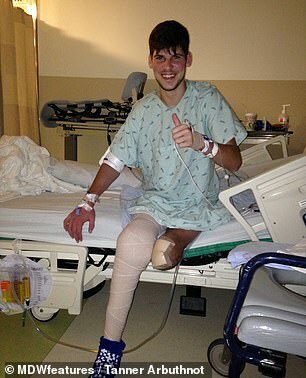 Mr Arbuthnot also spent a week in a coma and, upon waking, was forced to make the heartbreaking choice between having his left leg amputated or keeping it. He chose to have it amputated, after being told keeping it could lead to infections. 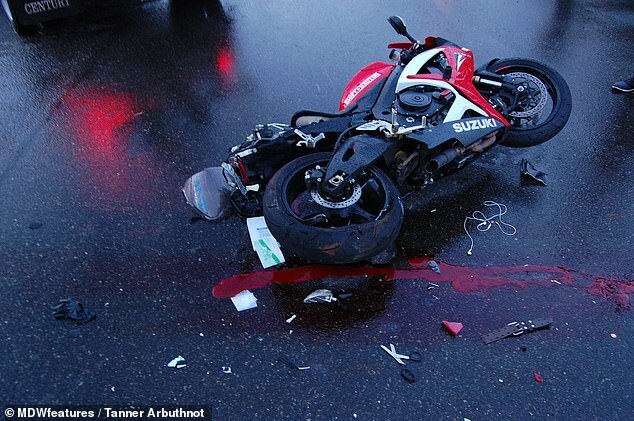 The force of the collision caused the back wheel of Mr Arbuthnot’s motorcycle to lift up and hit his head. Mr Arbuthnot’s body then folded backwards and he was pinned between the two vehicles. ‘I remember the truck pulling out in front of me but I’m very thankful to not remember the rest,’ he said. ‘Right before the accident, I had let go of the handle with my left hand and glanced over at a house nearby. Then it goes black. ‘When I hit the truck, I hit it head first, then the back tyre of the bike hit my head due to the weight and force of the bike. 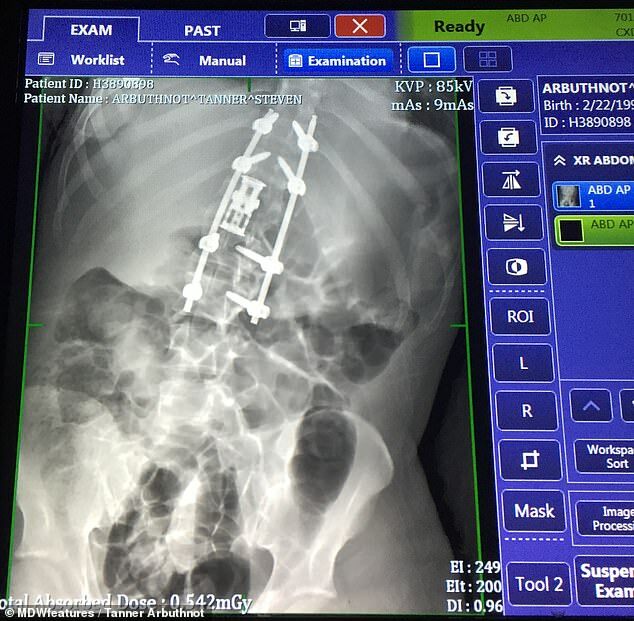 Once in hospital, doctors set about trying to save Mr Arbuthnot’s life, which included surgery to remove a vertebra and then fuse his spine back together, leaving him with a five-degree curvature of the spine. ‘It honestly damaged me from head-to-toe,’ he said. 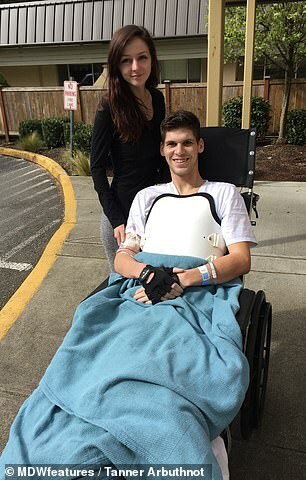 ‘I was overseen by some of the world’s best doctors who were telling me I was going to die or never walk or drive again. 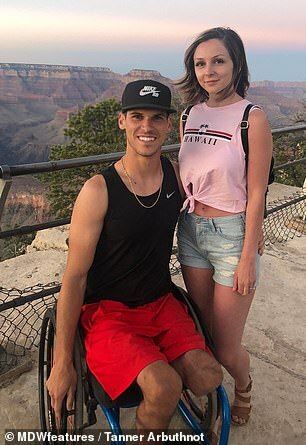 ‘I had a brain bleed, multiple fractures in the neck, shattered vertebrae that was removed and replaced with a metal cage, a spinal cord injury making me a ‘complete paraplegic. WHAT IS THE DIFFERENCE BETWEEN AN INCOMPLETE AND A COMPLETE SPINAL-CORD INJURY? A spinal-cord injury occurs when the bony protection that surrounds the backbone is damaged. An incomplete injury means the ability of the spinal cord to send messages to or from the brain is not completely lost. Some sensation and movement, even if faint, may also be possible below the site of injury. A complete injury is a total lack of sensory or motor function below the injury site. Mr Arbuthnot surprised everyone with his impressive recovery. ‘As time went on, I made it through more and more surgeries and kept pushing to live,’ he said. ‘I had multiple life-saving surgeries and they added up to 13 in the first month. Mr Arbuthnot was then put into a medically-induced coma and woke to be faced with a life-changing decision. 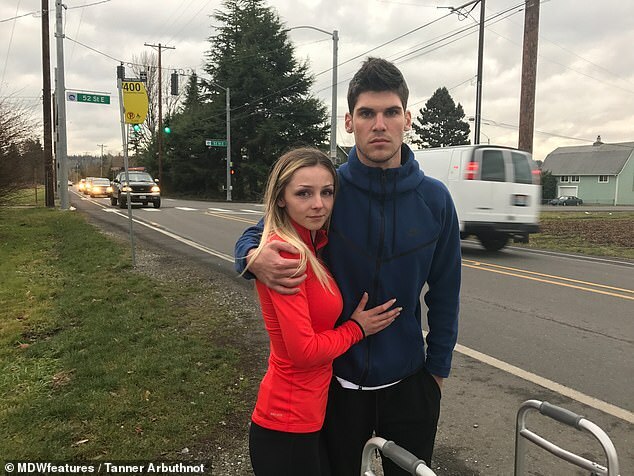 ‘They woke me up to decide whether to amputate or risk infection and potentially not surviving due to blood loss from the artery damage,’ he said. ‘The risk of infection came from the two inches of my femoral artery that had been torn out. ‘They repaired it using veins from inside my right leg, but the blood loss was so severe and the damage to the muscles was so bad it could have turned for the worst and killed me, or at least moved the amputation further up my leg. Following his amputation on February 9 2016, Mr Arbuthnot was forced to adapt to life. Working hard in physiotherapy, he taught himself to stand and walk on a prosthetic limb, and can even feel the tops of his thighs. 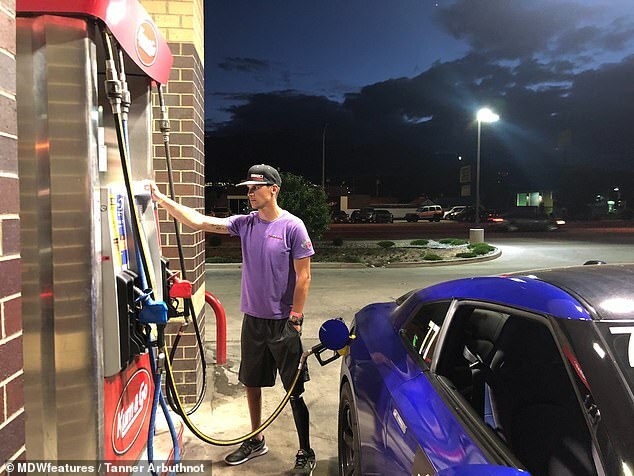 ‘Every time they tell me something’s impossible, I roll away and accomplish that thing shortly after just to prove to myself,’ he said. ‘Half the stuff I learned to do, like standing on my own, I taught myself while hiding from hospital staff in my bathroom because it “wasn’t safe to try” according to them. ‘I have feeling on the top of my thighs, and recently had some amazing new improvement in my inner shin. Despite his can-do attitude, the ordeal took its toll on Mr Arbuthnot. ‘I was 23 and all my friends were out enjoying life while I couldn’t get out there yet,’ he said. ‘Learning to live as a paraplegic is never-ending. 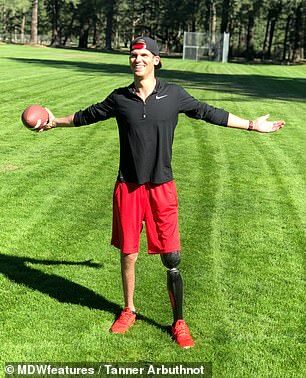 ‘It’s scary and this new lifestyle was so complicated with all the crazy injuries around my paralysis – I just didn’t know what to do. Although his memory of the collision is blurred, Mr Arbuthnot still endures flashbacks. ‘I’ve had a flashback on the road while driving recently when a truck almost pulled out in front of me though,’ he said. But the ordeal has taught Mr Arbuthnot how mentally strong he is. ‘Throughout it all I’m proud to say I’ve had a smile on my face and enjoy being alive,’ he said. Mr Arbuthnot has since launched Second Chance Racing so he can continue the motorsport he loves. ‘I’ve been blessed to be able to inspire many across the globe and I just want to continue to help others that didn’t have the support I had,’ he said. ‘I’m racing and transporting cars across the country. Mr Arbuthnot is speaking out to encourage others who have been through tough times. ‘If you have a dream, if you’re in recovery or if you don’t think you can make it out of something, you always can,’ he said.